You might say Bryce Yockey called his shot. 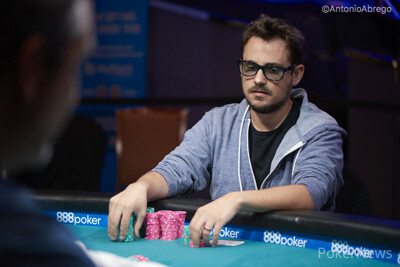 After zeroing in on Event #51: $10,000 Pot-Limit Omaha Hi-Lo 8 or Better Championship, the very first $10K PLO8 tournament in the history of the WSOP, Yockey told friends and fellow poker players he was going to win it. He booked as many side bets as he could, gearing up for a game he once grinded a ton but has barely played in recent years. There were some hairy moments, but Yockey did it , conquering a field of 207 for his first bracelet and a $511,147 payday. "I just f****** came through," an elated Yockey said. "It feels really good. It's different than winning a $1,500 tournament. There's a lot of tough pros to get through. It felt good to get here." Though Yockey lacked some experience in PLO8 after largely ignoring the game the past couple of years, he hasn't lacked in results. 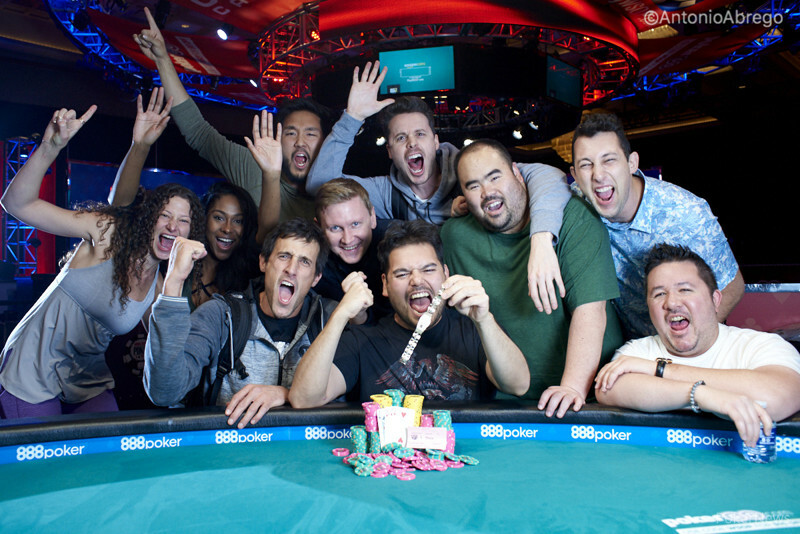 The Californian's previous four final table runs at the WSOP included two in PLO8. He got fifth in $1,500 PLO8 in 2015 for $50,171 and third in $5K PLO8 in 2011 for $180,180. Yockey had also gotten off to a hot start at this year's WSOP, with a final table run in the Millionaire Maker, cashing fifth for $317,544. He also said he's been on a heater in cash games, a welcome change from what he described as a bad downswing before the summer. "I just came in brimming with confidence," he said. "I feel like half of poker is your mindset anyways." Yockey wound up needing to get through a bigger field than expected, though. The event's inaugural running can't be termed anything other than a massive success after drawing double the runners of some of the other $10K championship events. A friend even bested Yockey on a prop bet regarding the number of entries. Yockey set the line at 140, while his friend placed the bar far higher at 200. With the $10K PLO Championship also drawing a record number, it's clear the appetite for four-card poker is as high as it's ever been. "Every pro I talked to is like, 'Wow this was an amazing success,'" Yockey said. "I think everyone who played it had a good time. I know two guys who flew in just to play this tournament." 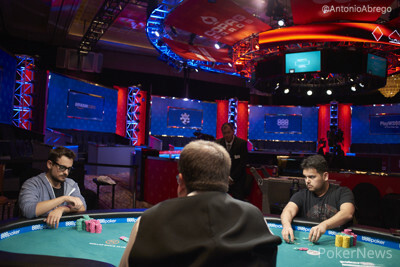 The final day of the event saw 15 players return, but after some early eliminations reduced the field to an official final table of eight, an hours-long stalemate ensued. As the blinds climbed ever higher, each player seemed content to wait and pick his or her spots, with hardly any pots even being all in and chopped. After the close call in the Millionaire Maker, when Yockey was among the chip leaders with tables left, he stayed focused and was determined to see this one to the end. "I really thought I was gonna win that one," Yockey said. "I felt like that was another one that kind of slipped away." 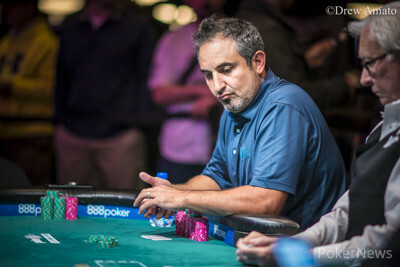 Two-time bracelet winner Josh Arieh was the player dominating and driving much of the final table action that did take place. 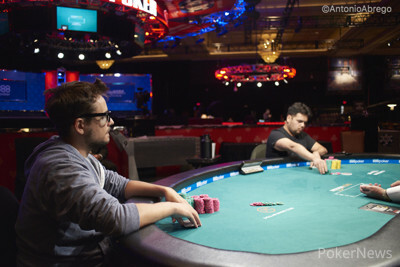 Perhaps the most harrowing moment of the final table for Yockey came five-handed, when he was in fifth place and found himself all in, at risk and way behind against Arieh. The two got it in blind-versus-blind with Arieh holding double-suited aces and Yockey a suited ace with ace-deuce. The flop brought two queens and a seven, along with a four-flush for Arieh, so things looked very grim for Yockey. He stood up, turned his cards face-down, and told everyone "good tournament." Running lows brought a backdoor chop for Yockey. "It's funny because I'm not really a superstitious person," he said. "But I feel like if you're not superstitious, it's a freeroll to pretend like you are. "I get that terrible flop. In my mind, I'm like I know I'm not dead, but I feel almost dead. I feel like I see so many people that stand up out of their chair and get exactly what they need." Influenced by the air from the beating of a butterfly's wings in Yockey's stomach or not, the right cards came for him. He grinned, sat down and got back to work. He maneuvered past his final four opponents, including poker pariah Chris Ferguson, finishing the job for a bracelet at long last after all of the close calls over the years. To see how much it meant to Yockey, all one had to do was observe him in any number of the key pots he played. He shouted curses after a couple of tough beats and seemed to be on a true emotional roller coaster through the ups and downs of the final table. All of the scars that built up from the close shaves made it all the sweeter this time. 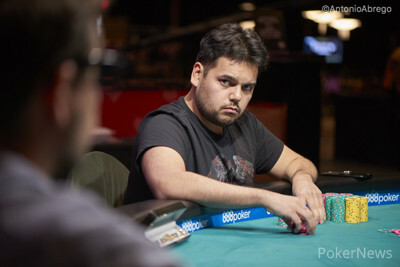 "The times I think I'm going to win one, but I don't, it's like I slowroll myself," he said. "It hurts [to lose a key pot] because every pot is one step closer. "I think it hurts more to get a final table and then bust than it does to bust early or min-cash. You feel so close, and if winning means something to you, nothing hurts more than getting close and not getting there." From the button, Jeremy Joseph raised to 360,000 and Bryce Yockey called in the big blind. The dealer spread a flop and Yockey cut out a bet of 550,000. Joseph responded by announcing pot and being bound to a raise totaling 2,370,000. Yockey announced he was all-in and Joseph called off his remaining 400,000 and the cards were placed on their backs. Yockey was in the lead with his top pair and both players held a straight and low draw. "Picture!" screamed Yockey as the dealer delivered the on the turn. For Joseph, he would need an eight, seven, six or deuce to remain alive, but when the dealer burned and turned the board-pairing on the river, Joseph would be eliminated in 2nd place for a $315,911 payday. As that river card landed, Yockey rushed to his rail to celebrate jumping up and down in excitement after having collected his first WSOP gold bracelet and the $511,147 first prize. Jeremy Joseph and Bryce Yockey saw an flop for the minimum. Joseph check-called 125,000 and both checked the turn. On the river, Joseph potted for 490,000. Yockey tanked a bit and called but mucked upon being shown . Bryce Yockey limped the button and Jeremy Joseph checked the big blind to see a flop. Joseph led out 150,000 and Yockey called as the turn landed the and Joseph bet again; this time for 400,000. Yockey called, and when the river landed the , Joseph checked and Yockey bet out 650,000. 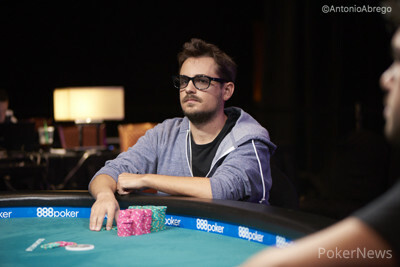 Joseph immediately folded and dropped to 2.4 million as Yockey scooped the pot and move to 7.9 million. Jeremy Joseph limped the button and Bryce Yockey checked as the dealer spread a flop. Yockey led out for 150,000 and Joseph called as the landed on the turn. Yockey bet 375,000, and again Joseph called before both players checked the on the river. Yockey tabled his for a full house and Joseph mucked his hand. Bryce Yockey limped the small blind and button, and Jeremy Joseph checked to see a flop. Joseph checked and Yockey bet 125,000 only to have Joseph check-raise to 300,000. Yockey folded, and Joseph collected the pot. Following a short break, Bryce Yockey and Jeremy Joseph have now begun their heads-up battle. There is 28 minutes and 52 seconds remaining in this level, and players will have the option to play one more level once this and the next one are complete in an effort to finish the tournament. Bryce Yockey potted in the small blind, and Josh Arieh called. Yockey bet 275,000 and snap-called when Arieh jammed the flop. Yockey had flopped queens up. The turn and river kept them best, and Arieh told everyone good game on his way out. Josh Arieh raised his button to 300,000 and Bryce Yockey called in the big blind as both players checked the flop. The turn landed the and Yockey led for 400,000 with Arieh calling as the completed the board on the river. Yockey bet 1,000,000 and Arieh went deep into the tank for nearly three minutes before releasing his hand.